Larry Dyke is one of America's most renowned landscape painters. This image contains all the trademark elements that make a Dyke painting so recognizable. The Texas Hill Country is known for its beautiful, rugged scenery, with many picturesque, quiet places. This very popular and cherished region of the Lone Star State beckons people to discover the many natural secrets it holds. 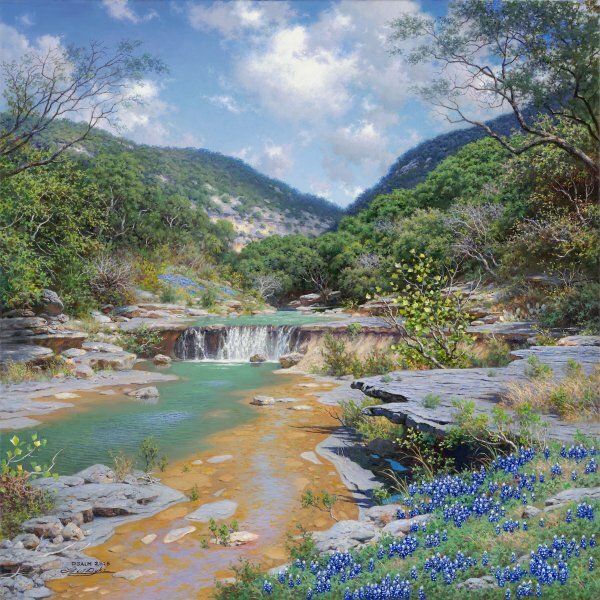 This secluded, rocky canyon, with its clear, cool water, and colorful patches of bluebonnets completing the scene, is one of Dyke's finest Texas landscapes.